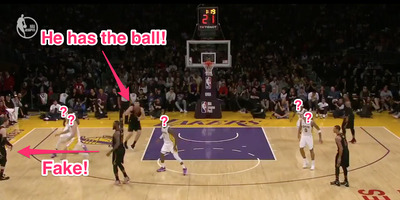 ESPNLeBron James fooled every Laker on the court with this no-look pass in the second quarter. LeBron James faked out all five of the defenders on the court with a no-look pass during Sunday’s game between the Cleveland Cavaliers and the Los Angeles Lakers. James is averaging a career-high 9.0 assists per game this season. Later in the game, James would thread the needle between Lonzo Ball’s legs for another highlight-worthy pass. LeBron James added a few more amazing passes to his highlight reel on Sunday night against the Los Angeles Lakers. With the second quarter winding down in Los Angeles, LeBron brought the ball up and faked a one-handed pass to teammate Kyle Korver, sending the eyes of all five Lakers defenders in Korver’s direction. But James pulled the ball back, and without moving his eyes, hit a wide-open Ante Zizic as he cut behind the Lakers for an easy dunk. Here it is from the in-game angle. LeBron fooled everyone with this no-look pass! ???? But further replays would show just how impressive James’ play was – all three Lakers near the ball (and even the cameraman!) followed his fake pass before he sends in the no-look for the uncontested bucket. That wasn’t even the end of LeBron’s highlight-filled evening. Later in the game, James sent a bounce pass through Lonzo Ball’s legs that would have been good for an assist had Jeff Green not missed his dunk attempt. It’s been a great few weeks for unbelievable LeBron highlights – just two weeks ago James gave basketball fans one of the most insane demonstrations of ball handling ever caught on film, and he claims he’s playing the best basketball of his career. Unfortunately, his impressive pass wasn’t enough to carry the Cavaliers to victory on Sunday night – Cleveland fell to Los Angeles by a final score of 127-113.